Gorgeous mixed taggies around edge that baby will love to feel. The legendary Linus, who takes his security blanket everywhere in the comic strip ‘Peanuts’, tells us that he gains immense emotional comfort from it. Comforters help babies self-soothe and settle and this one is satin-soft and super-cuddly. The silky ribbons and soft touch fabric invite exploration and give your baby’s little fingers the experience of different textures. 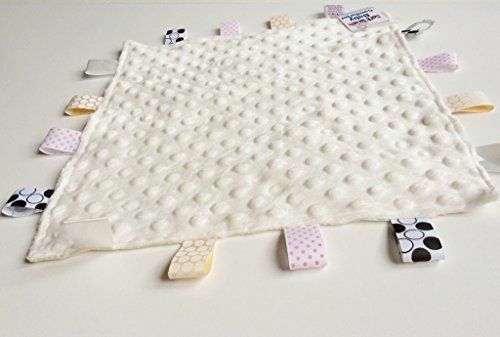 When your baby is tired, distressed, in an unfamiliar place or unwell, the comforter will offer security and comfort. What to do - to make the comforter special for your baby, sleep with it against your skin for a few nights to infuse it with your reassuring scent. Place the comforter over your shoulder when nursing or burping your baby so that it bears the smell of milk. Your baby will soon become attached to it if it smells good. Have 2 or 3 machine washable comforters in case one gets lost and for hygiene reasons. Rotate them regularly to ensure that they get equal wear and tear. To be on the safe side, take the comforter out of the cot when your baby is sleeping.